Over the years, passenger safety has emerged as a topic of hot discussion amongst car manufacturers and component makers alike. In fact, recent studies show that more than 75 per cent of new car buyers opt for products with a high safety rating. In view of this, the automotive industry is, of course, working harder than ever to come up with new and more effective safety equipment. And this means we’re going to see some sophisticated safety tech in cars soon. 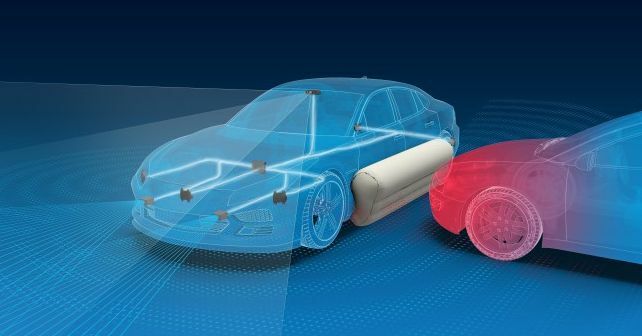 One of these is going to be a new external pre-crash airbag system, which ZF – the renowned gearbox and component manufacturer – showcased recently. It's called ‘Pre-Crash Airbag Activation’ system, and ZF claims that it'll make cars of tomorrow safer. While the term ‘Pre-Crash Airbag Activation’ is self-explanatory, there are a few things that you ought to know. The airbag in question here is not for occupants inside, neither is it for pedestrians. Instead, this new system is basically an advanced external pre-crash airbag that’s used to create a ‘lateral crumple zone’ prior to a collision. To put it simply, the airbag is deployed externally from the side of the vehicle moments before an imminent collision is detected. According to ZF, their tests show that the external airbag helps reduce the occupant injury severity by up to 40 per cent. Additionally, ZF is also working on safety equipment that can adapt to ‘new seating positions’ for autonomous vehicles, since they believe that in future, it will be possible to recline a seat or turn it to face other directions. And as a result, restraint systems like seatbelts and airbags will have to be designed to help protect the occupants in these flexible seating positions and will increasingly be integrated into the seat itself. As a result, the company is working on something called adaptive ‘dual contour’ airbags. These airbags are designed in such a way that they allow a new degree of freedom in the passenger compartment that automated driving has created.